What brought me to Pastor Scott Searl’s office one day was his car. I saw his white Ford Escape in the synod office parking lot when he was at a meeting. 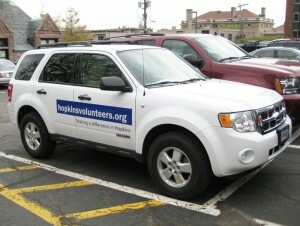 There on the driver’s side door was the Shepherd of the Hills Lutheran Church logo, and the passenger’s side had www.hopkinsvolunteers.org printed on it. Of course I was intrigued. Was this his own personal car? Was this some new advertising for the church and the city of Hopkins? Searl shared the story, which ended up being much bigger than some stickers on his car. When Searl was first called to Shepherd of the Hills, he wandered around his new mission field to see what was out there and meet people. It started when Ollie Rasmussen, a longtime member of Shepherd of the Hills (ELCA, Hopkins) gave an unexpected generous donation with the instructions to use it however the congregation’s staff wished. Not wanting to impact the budget dramatically, they set asie the donation for use later. When Searl was first called to Shepherd of the Hills, he wandered around his new mission field to see what was out there and meet people. In the Hopkins area, he found a vital network of educational, charitable, medical, and civic organizations helping to support families, adults, and children in need. In all cases, these organizations rely on volunteers to maximize the reach and effectiveness of their programs. They need help. 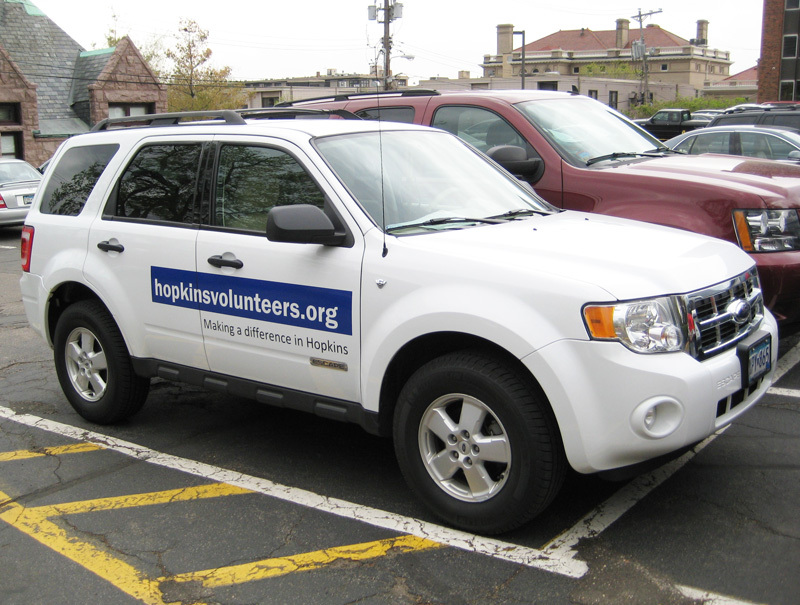 Most volunteers like to serve near where they live. They like being close to home and the feeling that they’re helping to strengthen their own community. The website is helping to do that. First, they hired a person to do research and interview people in the community. They partnered with the Hopkins School District, and bought the domain name. They contracted someone to build a website with a volunteer management system on the back end. Shepherd of the Hills has more than 20 different partners who have volunteer opportunities available, and it recently placed its 120th volunteer. With more than 300 people on the email distribution list, the congregation can send out information featuring volunteer opportunities in the Hopkins area. Church members are in talks with the City of Minnetonka and Oak Knoll Lutheran Church to start a volunteer website for that city. With his car, Searl gets stopped and people ask him about it. He says, “My dream is to help Hopkins be known as a great place to live and if you live here, you volunteer in the community.” He wants Shepherd of the Hills to be known as the place that helps people serve … whether you go to church there or not. Sara Masters is director of communications for the Minneapolis Area Synod of the Evangelical Lutheran Church in America. She is a member at Immanuel Lutheran Church (ELCA), Eden Prairie, Minnesota. This article is reprinted from the synod’s InterActs newsletter.